Highest security rating for maximum protection in high-crime areas. Prevents ride-away, rollaway and carry-away theft. 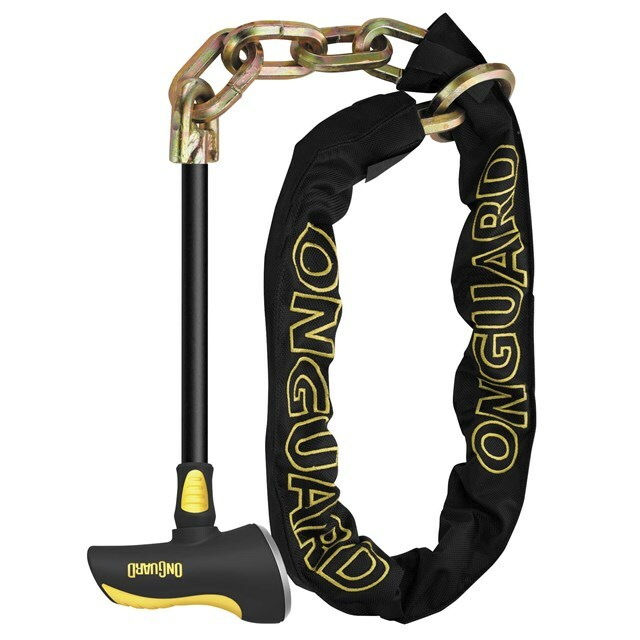 X2P dual lockdown protection with a massive 12 mm hex link chain and pass through ring made from cut-resistant, ultra-hardened steel for amazing versatility in tricky, hard-to-lock situations. The most versatile powersports lock. Use the loop to wrap around a solidly anchored object, then run the 10 in. long steel bar through a hole on your vehicle and lock the T-head on the other side. Locks also feature rubber end caps and vinyl coatings to protect finishes. Reinforced crossbar sleeve and cylinder for additional security. Water- and heat-resistant embroidered chain cover prevents scratching and allows compact coiling. Rotating dust cover protects cylinder.